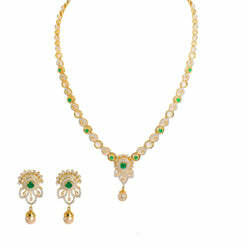 22K Yellow Gold Necklace & Earrings Set W/ Kundan & Hanging Pearl on Asymmetrical Drop Collar for women. Adorn yourself with this unique set of kundan gems with a hanging pearl, among varied engraved details on an asymmetric collar frame. The necklace 14" long with a width range of 2-15 mm. Its pendant is 11 mm long and 7mm wide. Each earring is 43 mm long and 11 mm wide. This regal set weighs 29.7 grams. 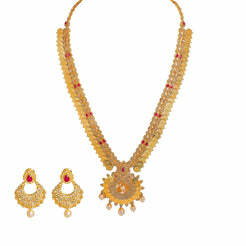 Wear this set to add a unique touch to your formal or dressy attire.